When I first began creating the entrance block out, I made sure to use the unreal engine player character to properly scale my scene. This helped with the initial scaling of the main entrance of the building. I started with the door frame, carefully referring back to the original art piece. Once I had the door frame and the door added in behind, I started working on the main outside walls. It took some time to get the sizing right to have the modular pieces working properly. 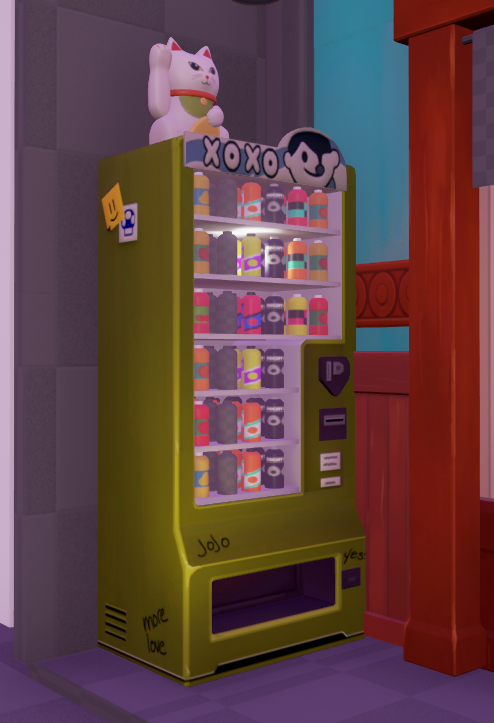 I chose to model the vending machine after I had some decent framework going on, so that I could use the vending machine as a size reference for the other props. This ended up helping a lot when I was determining the distance between the door frame and the walls from the building on the right (left when looking at photo). I also used the vending machine to give me a better idea of how high the board that the main sign sits on would be. 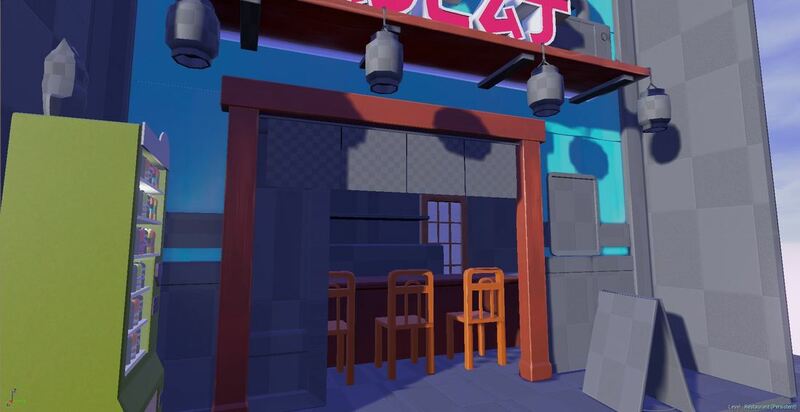 Blocking out the size of the inner area of the restaurant was quite challenging. It took some time to figure out where the walls needed to be placed because the photo made it a bit hard to read. I needed to really plan out how big the side walls and the back walls needed to be in order to place everything accordingly. The trim turned out the be the most difficult prop for me to model. I was certain it was going to be the roof tiles, but was quite surprised at how long it took for me to get the shape and size down, as well as trying to make the pieces modular. I did my best by referring to the photo as much as possible so that it would closely resemble the original. By the time I got to the roof I had a pretty good idea of how I was going to block it out, and I created two separate pieces. First I created the cylindrical piece and I used the soft select tool to give it the curved shape it has in the photo. Then I duplicated the piece and made a more flat shaped version and modeled it to the shape in the photo. 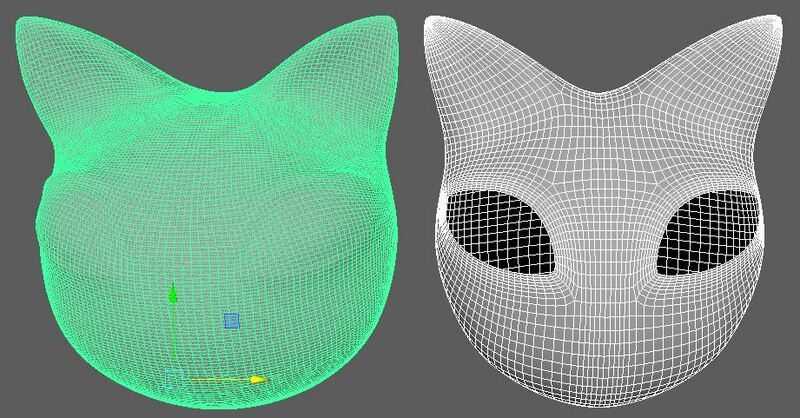 For the Cat Head I struggled with getting the shape of it as close to the picture as possible. I still think the ears are a bit off but I don't have time to fix it any further. I took the block out mesh and brought it into ZBrush to model a high res version. After ZBrushing it needed to Retopo it in Maya, which took a little while to get some good edge flow. I also Found it much easier to not add the eyes to the final mesh and instead model them separately. My texture is turning out nicely, I just have a few more things to add to the ears. The mouth also needs some more work to give it more depth, but the normals should help once I create the materials. So far I like how the colors are matching up, I still need to work on the textures and add the materials for most of the wooden pieces. 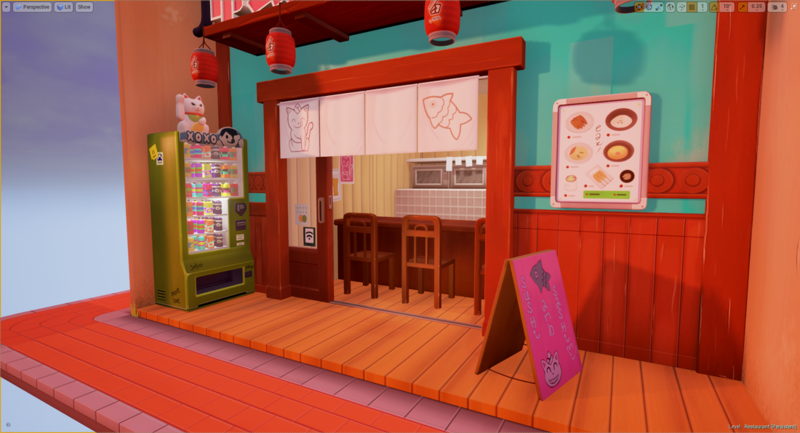 I spent some time making sure all the colors were close enough by bringing them in to unreal. I also added my own door to the inside of the restaurant to make it look more like a kitchen. I thought it needed some indication of a kitchen being behind the seating area. 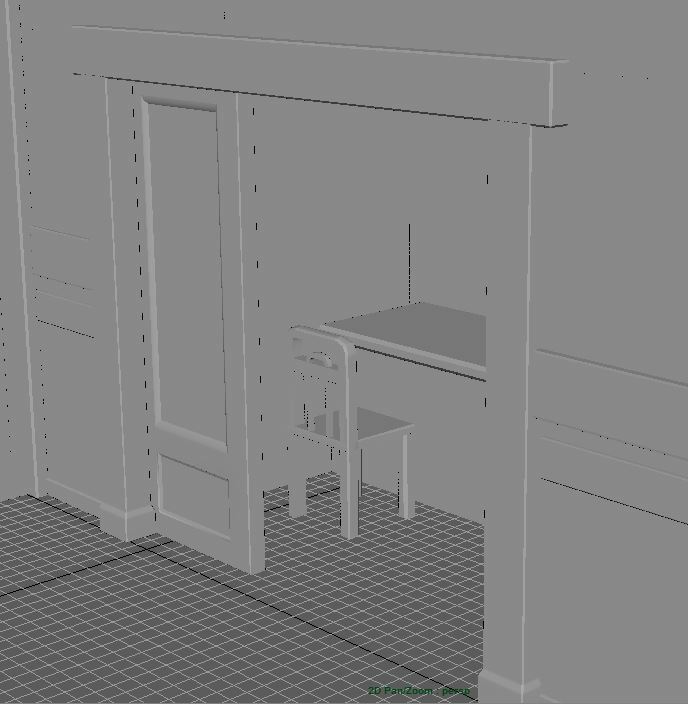 For the most part I think the textures turned out okay, but i want to make the white "paper" pieces more reflective, and then maybe have some yellow lighting from behind the door shining through. After trying to do a lot of catch up work on my Capstone, I needed to start working on my Vending Machine. When I took a closer look at how the inside of it was set up, I realized that it does not appear to be a functioning vending machine. The shelf that the bottles sit on are pressed right against the glass, so there's no where for the bottles to go. 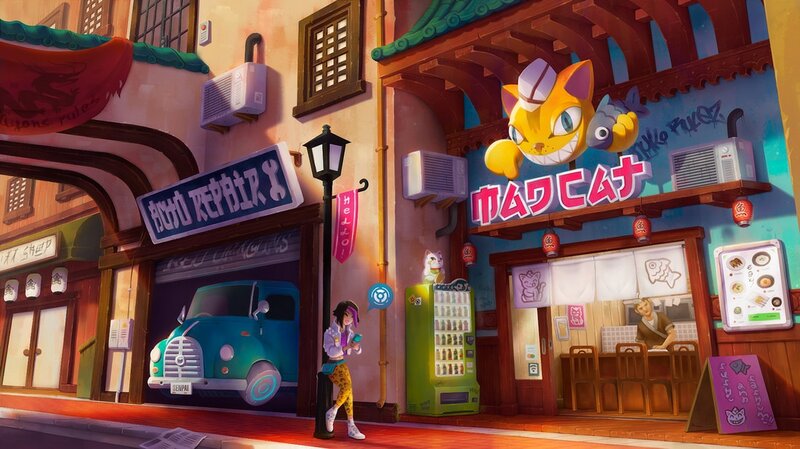 I'm not sure what the artist had i mind when drawing this vending machine, but I've decided to just follow the concept art and model it exactly how it is in the picture. I'm pressed for time already, and this would almost require me to come up with a new interior for the machine, if I were to make it functional. 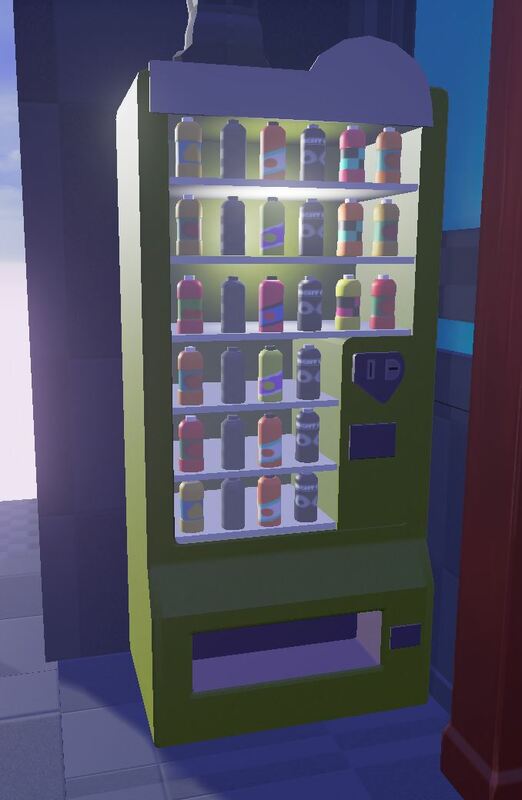 I've almost completed the Vending machine. I still need to finish texturing one more bottle inside. Overall I am extremely happy with how it turned out. I think the small details really add a lot to the final product. The only thing that s lacking is how the lighting reflect on it, but I'm still tweaking my lighting every week. I also spent an entire weekend almost finishing the fortune cat that sits on top. I modeled the arm separate so that I could and a small animation where the arm moves up and down slowly. I think that will add a lot to my piece. I think the entrance is turning out nicely. I still need to fix the seems on the wooden wall piece so that it looks nicer and does not show the seams so much in the middle. I really like how the wooden door frame looks, and I think I did a fairly good job at matching the colors nicely. 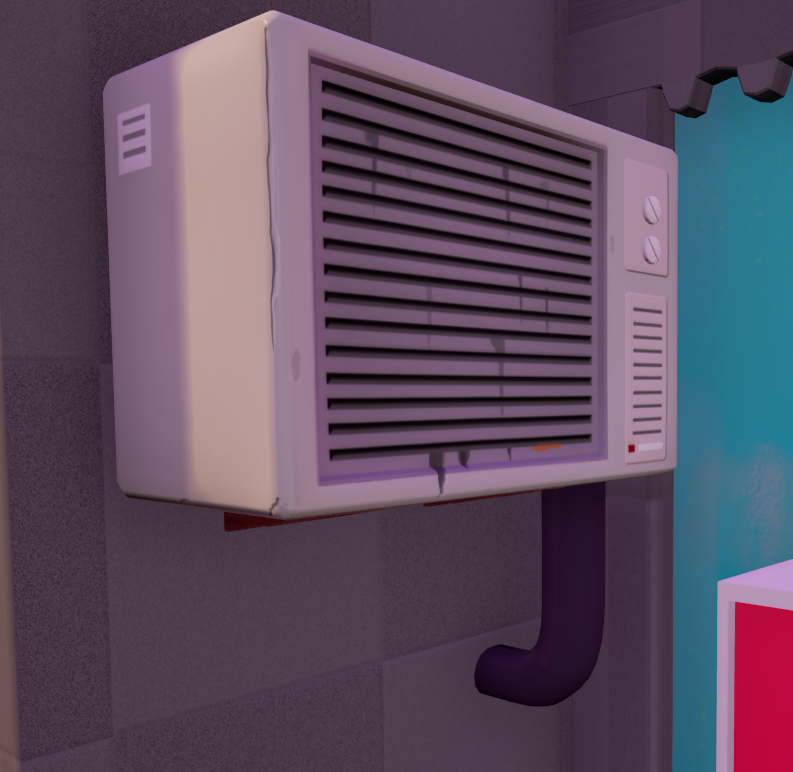 Once I had finished the Air conditioner I think it really started to bring the whole piece together for me and made it feel a lot more completed. It almost made me start seeing the light at the end of the tunnel. 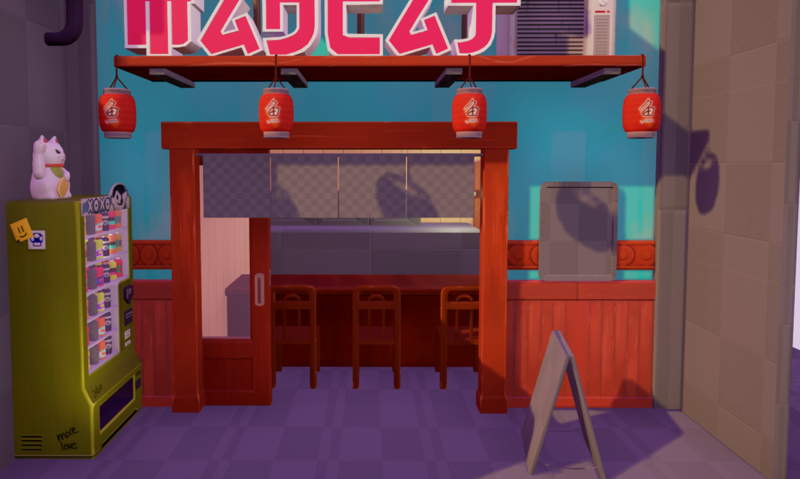 I'm really enjoying texturing this scene and I'm hoping to have it mostly finished by next weekend. The finished roof turned out pretty good. I didn't have much reference for the flat tiled part so I had to make it up. I mostly just copied the the cylindrical tiles texture for the flat tile. I did my best to match the colors while giving it a painterly feel. I didn't spend too much time on it because its not going to be the main focus of the piece. 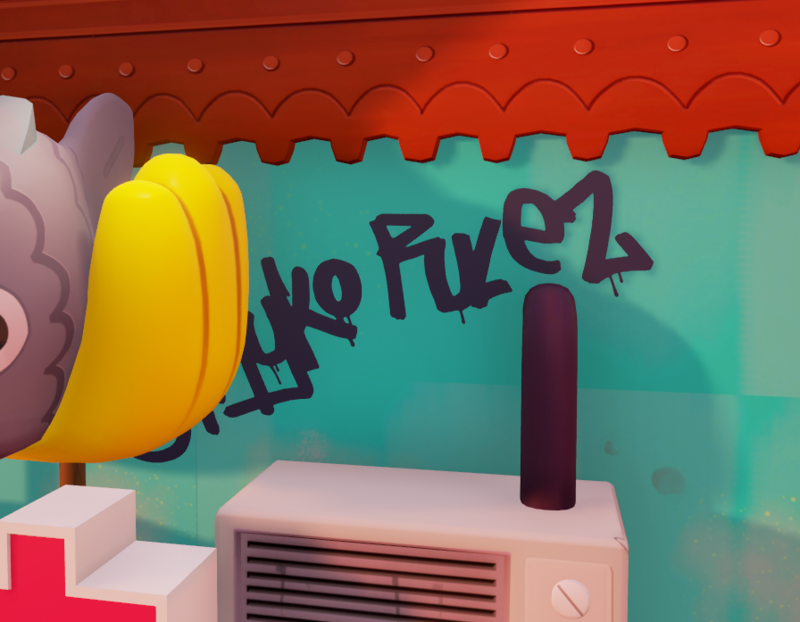 I had a lot of problems trying to make a decal in Unreal. I was trying to make the spray painted text and I ran into a lot of issues. The biggest issue was that if the decal sat in any area that had shadow in it, it would not show up. I searched online as to why this was occurring and it was because decals are fairly new to unreal and they still have so bugs to fix. There was a fix I found for it, but I am pretty sure it involved creating some code for it to appear in the shadows. I ended up just creating a plane and applying to the text to that instead. The entrance turned out really good in my opinion, I'm really happy with it. I worked really hard trying to get it to look as close to the concept art as possible. I still need to fix the inside of the lanterns and turn on the two sided faces. Other than that this entrance areas it pretty much done. I also need to fix the shadows and add some contrast in the scene. The shadows are not dark enough so Ill just have to increase the darkness. Another thing that was an issue for me was the corner pieces of the sidewalk. The color is a bit off and is a little bit noticeable. I did my best trying to fix it, and I ended up just leaving it like that because I didnt think it would be visible in most of my shots in my demo reel.